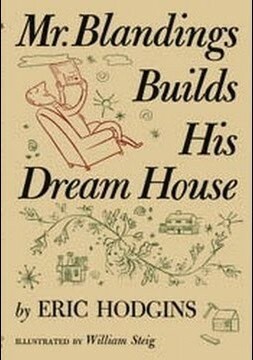 Eric Hodgins’ amusing tale of a man who “started out to build a house and ended up, buffeted and bilked, spending three times what he had planned,” first appeared as a short story, “Mr. Blandings Builds His Castle,” in Fortune magazine’s April 1946 issue (which also covered the housing shortage) as well as the April 29, 1946 edition of Life and Reader’s Digest July 1946. Hodgins expanded the story into a novel, with charming illustrations by William Steig. Published later that year, it became an instant best-seller. 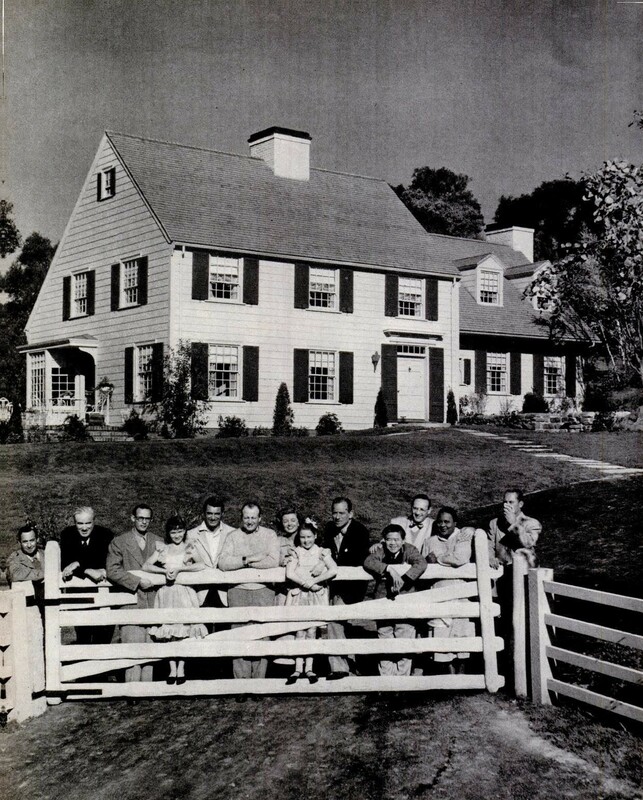 Based on Hodgins’ real-life experiences in rural Connecticut in 1939, the Blandings’ home building struggles were highly relatable to 1946 readers. In 1947 the film version got underway, to be made by R.K.O. and released through David Selznick’s Selznick International. Hodgins came to Hollywood to help work on the script. Someone got the bright idea of getting builders around the country to construct local Blandings “dream houses” as a publicity draw that could later be sold or raffled off for charity. In all there were 73, according to a Los Angeles Times report in 1948. G.E. 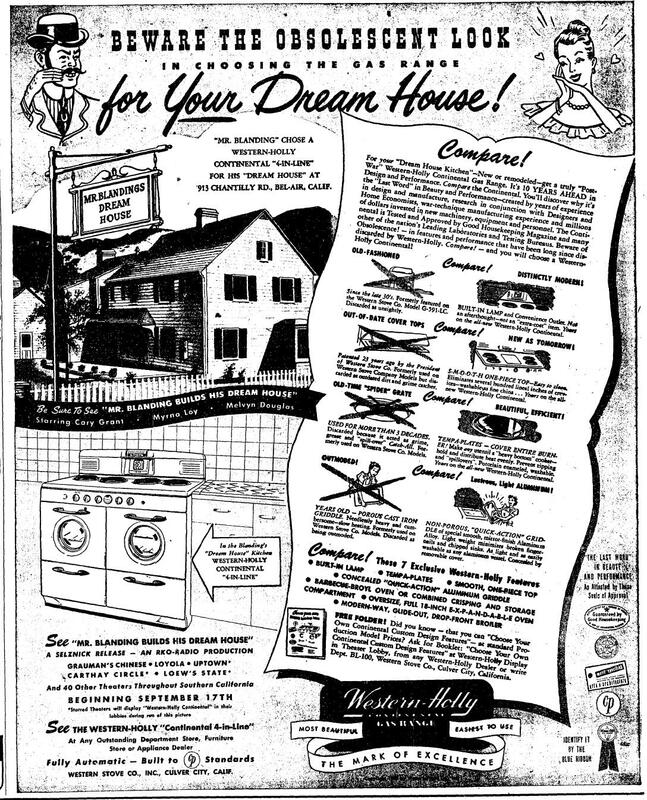 was the first and one of the largest sponsors of the nationwide Blandings “dream house” campaign. 1948. 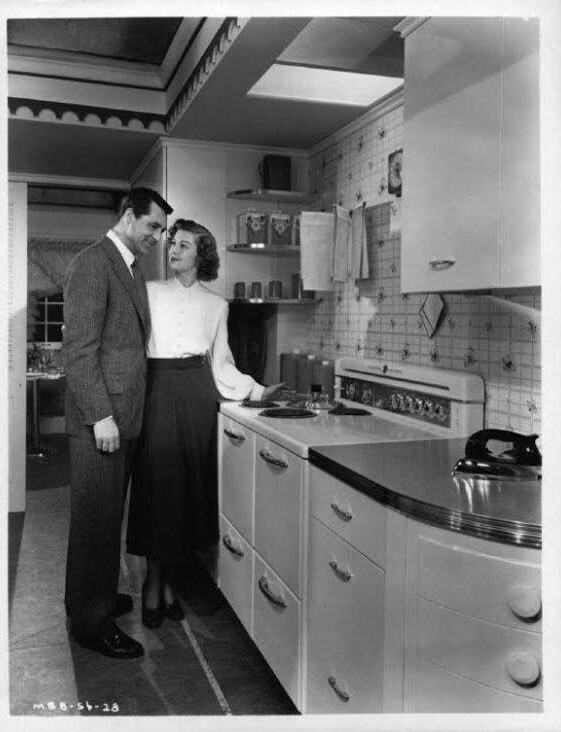 Promotional still with Myrna Loy and Cary Grant in one of several poses with the “Blandings Kitchen.” According to author Eric Hodgins, G.E. flew all the appliances needed to equip the film’s kitchen set, which is barely seen in the finished film. 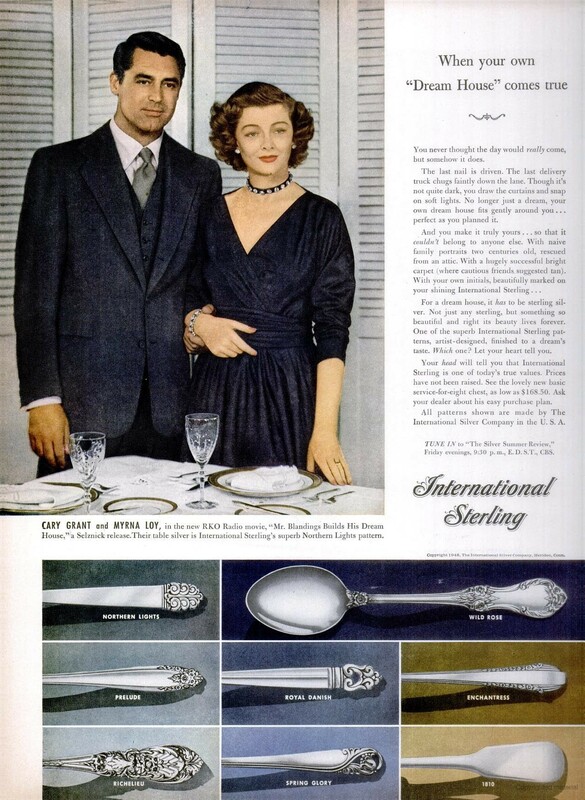 Myrna Loy and Cary Grant as Mr. and Mrs. Blandings also endorsed International Sterling. 1948. 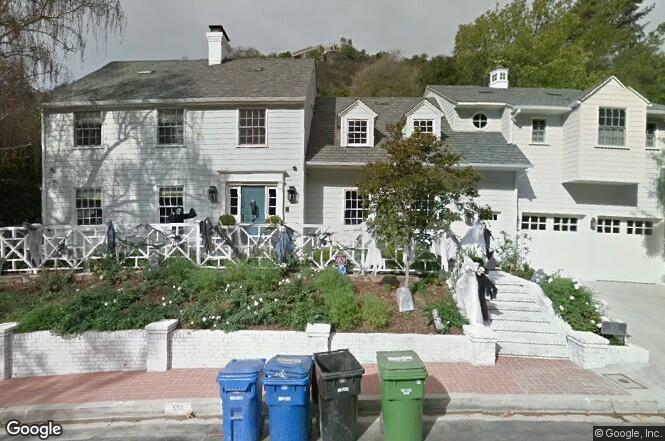 The Los Angeles “dream house” was constructed by Bel-Air Builders at 913 Chantilly Road, Bel Air in early 1948. 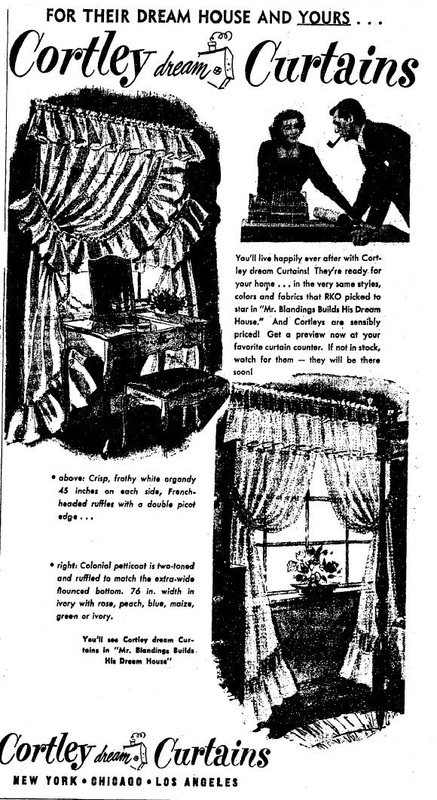 Bullocks did the interior decoration and furnishing. Other local businesses provided drapes, blinds, and other amenities. The public could tour the house, much as they had with the Fritz Burns Postwar House demonstration home on Wilshire Boulevard. Proceeds were to benefit construction of the Memorial Medical Center. Opening on June 5, 1948, about 350 people a day visited the house until it closed on November 25. Bel Air Builders put up the Los Angeles area Blandings fundraiser “dream house” at 913 Chantilly Road in Bel Air. 4-11-1948. 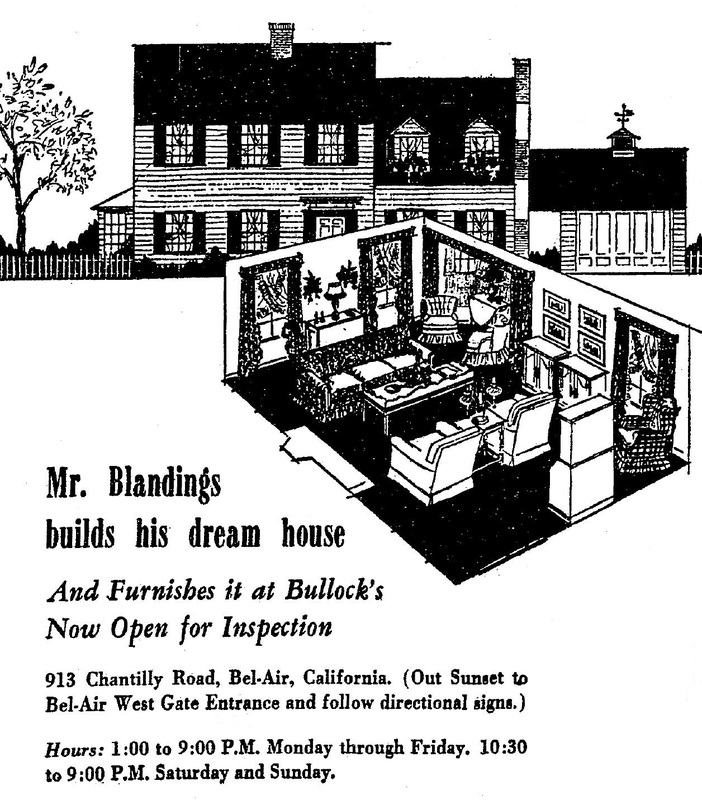 Bullocks department store did the interior decoration for the Blandings fundraiser “dream house” at 913 Chantilly Road in Bel Air. 9-8-1948. Cortley Dream Curtains were a natural sponsor for the Blandings fundraiser “dream house” in Bel Air. G.E. 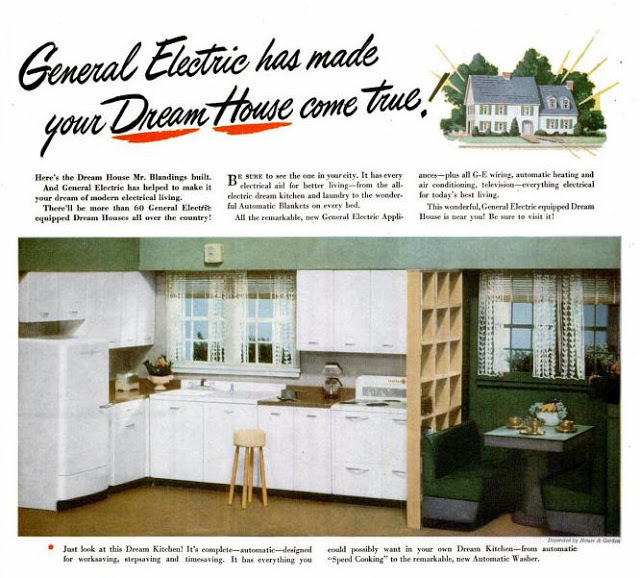 was a national sponsor of the Blandings “dream houses” across the country, but locally manufacturers Western Stove Co. of Culver City provided the Western-Holly range for 913 Chantilly Road. The house set used in the film was built on location, with the Malibu Hills (and some strategically-placed shrubbery) standing in for Connecticut. Blandings cast and crew in front of the house from the film. Now part of Malibu Creek State Park, it is still standing but looks quite different. From Life, 1948. The film began its Los Angeles run on September 17, 1948. Cary Grant, Myrna Loy and Melvyn Douglas starred. 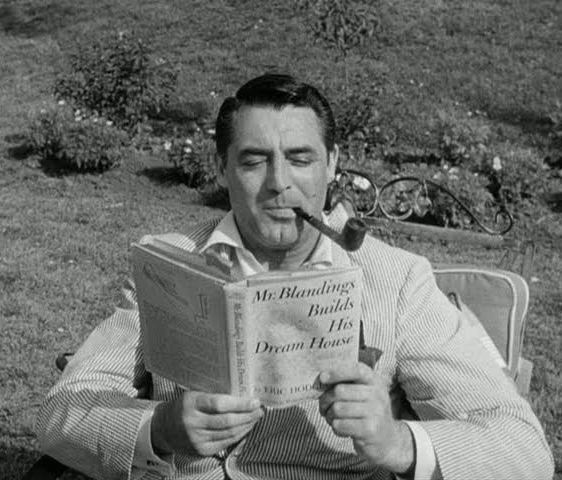 Eric Hodgins wrote a sequel, Blandings’ Way, published in 1950. 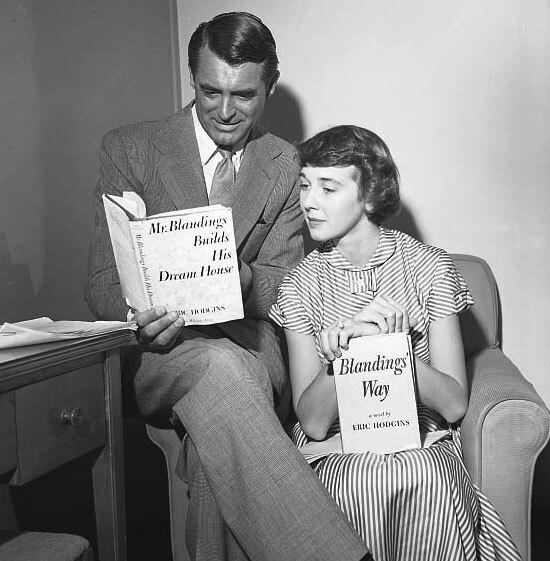 Cary Grant and then-wife Betsy Drake starred in a short-lived radio program based on the characters of Jim and Muriel Blandings, Mr. and Mrs. Blandings, which debuted on NBC in January 1951. In the premiere episode, the route for a new freeway threatens the dream house- something else Los Angeles could relate to. 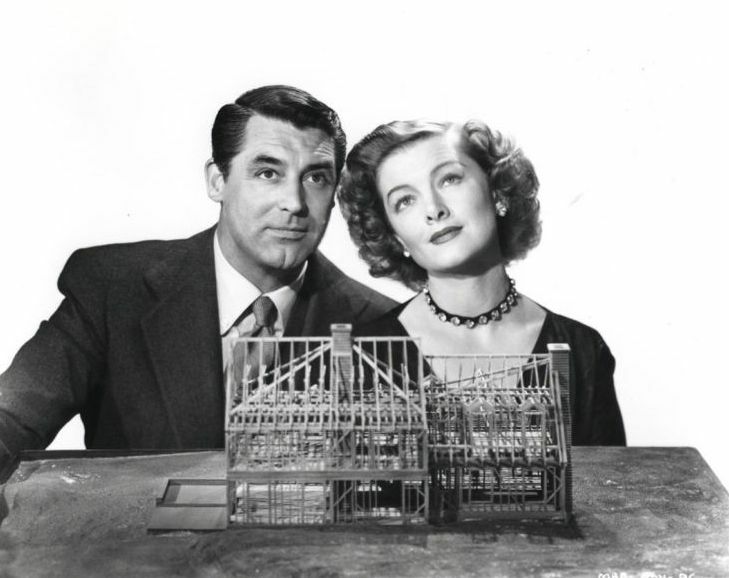 Cary Grant and Betsy Drake “read” the 1946 Mr. Blanding Builds His Dream House while Drake holds a copy of the 1950 sequel Blandings’ Way in a promo still for Mr. and Mrs Blandings, 1951. The charity “dream house” is still standing at 913 Chantilly Road. For the 1948 raffle winner, however, it was anything but a dream. According to newspaper reports, he took out a $15,000 mortgage on the house (then valued at $60,000) to pay the property taxes and ultimately was forced to sell it. In April 1955 he pleaded guilty to one of four counts of grand theft, and was sentenced to six months in L.A. County jail. His lawyer remarked, as lawyers will, that financial pressures after winning the luxurious home led to his client’s difficulties. 913 Chantilly Road today. Google.